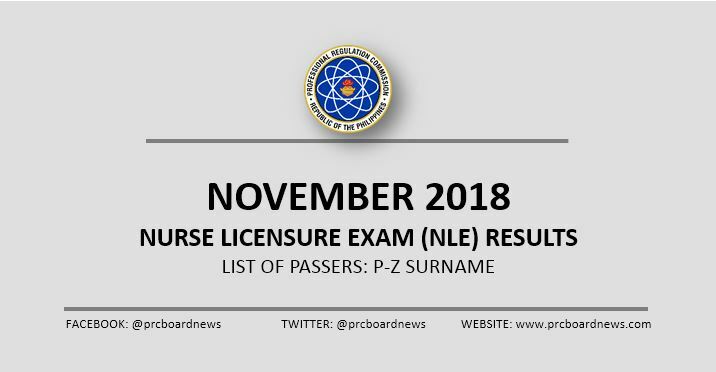 MANILA, Philippines - The Professional Regulation Commission (PRC) releases results of November 2018 nurse licensure examination (NLE) or nursing board exam results anytime on Friday, December 7 or in 14 working days after the last day of exams. The list of successful examinees of the November 17 and 18, 2018 NLE is available on this page immediately once announced. View on this page for P-Z Surname. Based on PRC Resolution No. 2017-1068, the target release of nursing board exam results is on Friday, December 7, 2018 or in fourteen (14) working days after the exam. how can i see if my sister passed or failed?